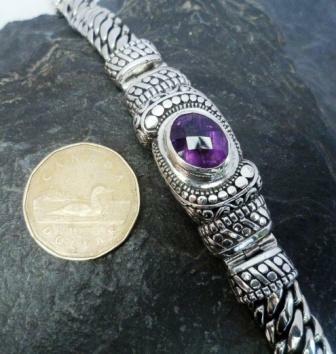 bracelet measures 8.50″ long by .75″ wide along the top and .40″ wide along the band by .66″ at the top. 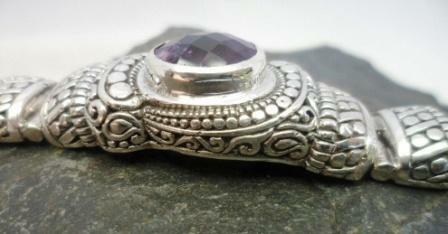 cushion cut oval Amethyst measures .33″ long by .50″ wide and is .50″ deep. SKU: bal007b. 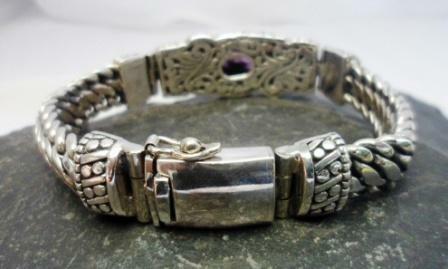 Categories: Sterling Silver and Gemstone Bracelets, Purple Amethyst Jewelry, Bali Sterling Silver Bracelets, All Sterling Silver Bracelets, February Birthstone Jewelry, Mothers Day Jewelry. Tags: .925 silver jewelry, 17th Wedding Anniversary jewelry, 4th Wedding Anniversary jewelry, 6th Wedding Anniversary jewelry, Amethyst Bracelet, amethyst gemstone jewelry, february birthstone jewelry, gemstone jewelry, mothers day jewelry, silver jewelry, sterling silver bracelets, sterling silver jewelry. If you love details, quality and uniqueness then feast your eyes on this beauty. 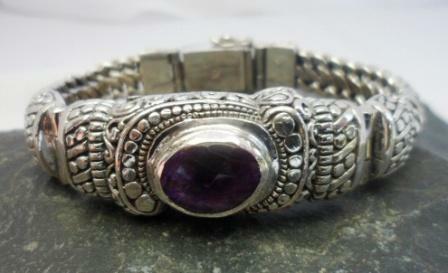 Spectacular Ornate Balinese Sterling Silver Amethyst Bracelet from Bali. Set around this gorgeous deep purple cushion cut Amethyst Gemstone is the most intricate silver work I have ever come across in any collection of Sterling Silver Jewelry. 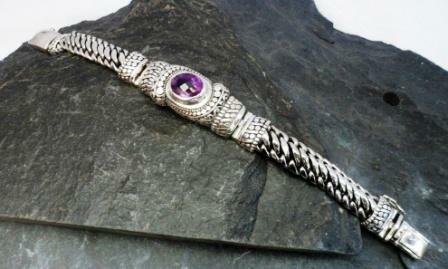 Looking at this Bracelet you first notice all the fine details surrounding the deep purple Amethyst Gemstone. Ornate designs of flat circles frame this Gemstone on both sides. Now turn it to it’s side. 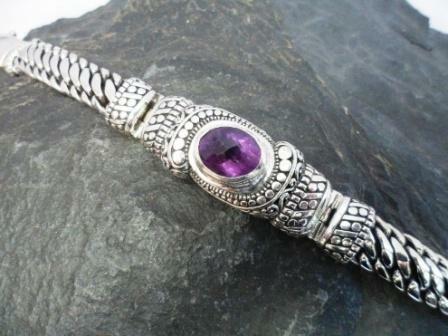 The Amethyst Gemstone is set quite high up on the Bracelet allowing the sides to be full of details of swirls and circles also. Now the Bracelet. A wide substantial Balinese link shows true Artisan Craftsmanship. A strong slide in clasp with locking side mechanism assures this beauty will not fall off. Now turn it over. Stunning!! Polished pattern of swirls. You don’t see many pieces that show details like this along the back. Now for the Gemstone. A beautiful deep purple oval cushion cut Amethyst. 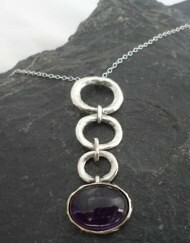 Each facet allows the Amethyst to sparkle. 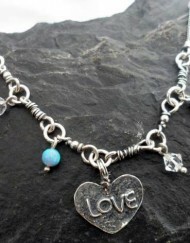 It is set into a deep polished bezel and sits high and proud on this bracelet. It’s often the best gem to calm and relax the nerves. 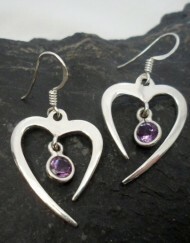 The energy of Amethyst nourishes the nervous system and allows it to move into a more relaxed state. Amethyst can be useful when we are going through emotional extremes or when we feel easily thrown off balance emotionally. 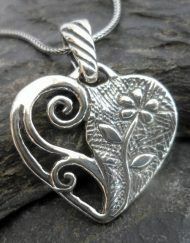 A very special piece that you will be proud to wear anytime. Click here to see all my Amethyst Jewelry along with more information about Amethyst Gemstones, and a legend you will love.